Smart consumers pay attention to their credit report because they know good credit helps create financial stability. People with high credit scores get to choose from a wider variety of loan options and usually enjoy lower interest rates than those with mediocre or low scores. 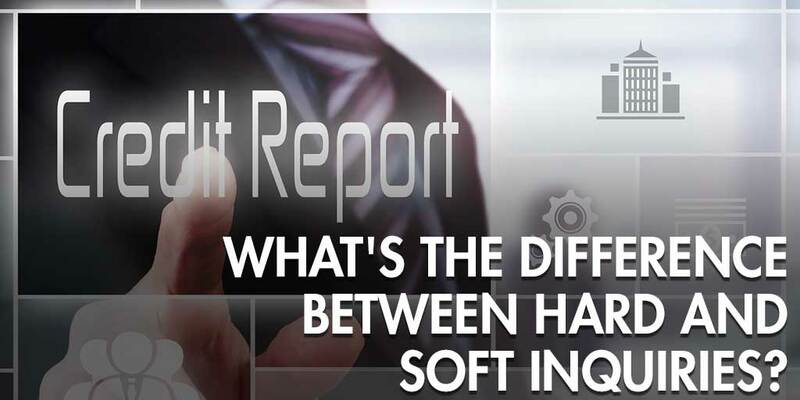 Understanding the difference between a hard and soft credit inquiry can seem confusing at first. Both of them review and measure your credit worthiness, but there are significant ways the two differ from each other. Both soft and hard inquiries occur when an external source looks at your credit report to make a decision about your credit worthiness. The Fair Credit Reporting Act (FCRA) governs how both types of inquiries are used. Soft inquiries are inquiries that are not initiated by you as the consumer. These may be used by one of your current creditors to make a decision about your credit limit. They may also be used to extend an offer of credit. This is how you get those pre-approved offers of credit cards in the mail. Employers and landlords may also pull credit as a soft inquiry and use the information they find to help them reach hiring or rental decisions. Insurance companies use soft credit pulls to help predict the chances of you filing a claim. Mortgage companies sometimes initiate a soft inquiry between the time they pulled the original mortgage credit report and closing. This helps them uncover any new debts that may hinder the mortgage loan being approved. Companies must have a good reason, or permissible purpose, under the FCRA to pull a consumer’s credit as a soft inquiry. There is usually not a credit score associated with soft credit pull inquiries. Hard inquiries are always initiated by you as the consumer. Mortgage lenders pull a credit report that shows as a hard inquiry to determine eligibility for a mortgage loan. Car, boat, and motorcycle dealers also initiate hard inquiry credit reports when you’re trying to finance a purchase through them. Your credit is pulled as a hard inquiry when you apply for credit and the credit card provider must determine your ability and likelihood to repay the debt. Other types of lenders may also pull your credit as a hard inquiry to decide whether to extend credit. Hard inquiries are also governed by the FCRA, and those who pull hard inquiry credit reports must have a valid reason. There’s typically a credit score calculated from the information on your credit report that goes along with a hard inquiry. The higher the score, the lower the lender’s perceived risk will be to lend you money. With a soft pull inquiry, a consumer usually does not have to give consent. For example, a lender can pull a soft inquiry to extend an offer of credit. Consent is required by the consumer before a hard inquiry credit report is pulled. The idea here is that it is the consumer that is actively trying to pursue a loan, so they must agree to a hard inquiry hitting their credit. The FICO credit scoring model states that inquiries make up 10% of a person’s credit score. They are talking about hard inquiries. A hard inquiry is driven by a person who is looking to borrow money. The scoring model looks at this as a mild threat to the person’s credit history. Why is this person taking on new debt? Too many inquiries in a short time period can decrease your credit score because they’re viewed by the scoring model as increased risk. Hard inquiries only account for a small percentage of the total credit score, with other factors like paying your bills on time and keeping credit card balances low playing much more of a factor. Since the consumer doesn’t initiate the soft inquiry credit pull, it has no effect on your credit score, and probably won’t even show up in the “Inquiries” section on your credit report. Understanding the difference between hard and soft inquiries allows you to manage your financial picture better and should relieve the stress of having an inquiry lower your credit score. Apply for new lines of credit judiciously to keep as few hard inquiries from affecting your credit report as possible.